My Comments: As an economist, I’ve talked consistently about the threat to society posed by income inequality. My rantings make zero difference at the national level, where if this issue is not addressed, there will be rioting in the streets. A friend and I talked this morning about the apparent collapse of societal norms he and I have used to navigate our lives for the past 60 years. Our hope now is that with the antics of 45 now a daily happening, the backlash from within the GOP and Democratic party, coupled with inevitable demographic changes, we’ll come out OK. Unfortunately, “hope” is rarely an effective management strategy. Meanwhile, I’ve also become more engaged with elected people at the local level. And so while I can do little more than talk about it, I’m sharing this article with people I enjoy spending time with who might collectively be called progressives. 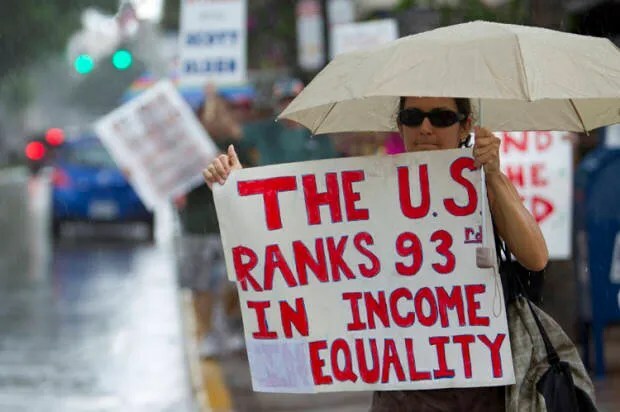 The income gap between the classes is growing at a startling rate in the United States. In 1980, the top 1 percent earned on average 27 times more than workers in the bottom 50 percent. Today, they earn 81 times more. The widening gap is “due to a boom in capital income,” according to research by French economist Thomas Piketty. That means the rich are living off of their wealth rather than investing it in businesses that create jobs, as Republican, supply-side economics predicts they would do. Piketty played a pivotal role in pushing income inequality to the center of public discussions in 2013 with his book, “Capital in the Twenty-First Century.” In a new working paper, he and his co-authors report that the average national income per adult grew by 61 percent in the United States between 1980 and 2014. But only the highest earners benefited from that growth. For those in the top 1 percent, income rose 205 percent. Meanwhile, the average pre-tax income of the bottom 50 percent of workers was basically unchanged, stagnating “at about $16,000 per adult after adjusting for inflation,” the paper reads. But the authors also note that the trend is not inevitable or irreversible. In France, for example, the bottom 50 percent of pre-tax income grew by about the same rate — 32 percent — as the overall national income per adult from 1980 to 2014. The difference? In the United States, “the stagnation of bottom 50 percent of incomes and the upsurge in the top 1 percent coincided with drastically reduced progressive taxation, widespread deregulation of industries and services, particularly the financial services industry, weakened unions and an eroding minimum wage,” the paper reads. President-elect Donald Trump’s administration promises at least four years of policies that will expand the gap in earnings. But a few glimmers of hope are emerging at the local level. The city council of Portland, Oregon, for example, recently approved a tax on public companies that pay executives more than 100 times the median pay of workers. The surtax will increase corporate income tax by 10 percent if executive pay is less than 250 times the median pay for workers, and by 25 percent if it’s 250 and over. The tax could potentially affect more than 500 companies and raise between $2.5 million and $3.5 million per year. There is also hopeful news in the educational realm. James Heckman, a Nobel Laureate in economics at the University of Chicago who has spent much of his career studying inequality and early childhood education, recently published a paper that lays out the results of a long-term study. In “The Life-cycle Benefits of an Influential Early Childhood Program,” Heckman and others report that high-quality programs for children from birth to age 5 have long-term positive effects across a range of metrics, including health, IQ, participation in crime, quality of life and labor income. Predictably, perhaps, the effects of the programs weren’t limited to children. High-quality early childhood education also allowed mothers “to enter the workforce and increase earnings while their children gained the foundational skills to make them more productive in the future workforce,” a summary of the paper reads. The research is important because early childhood education has bipartisan support. Over the summer, the Learning Policy Institute released a report that highlighted best practices from four states that have successful early childhood education programs. Two of them — Michigan and North Carolina — are swing states in national politics. The others are Washington and a solidly red state, West Virginia. Although it isn’t a substitute for other policy tools to address inequality, like progressive taxes, early childhood education has strong bipartisan support because it produces measurable payoffs for both children and the economy. One study found, for example, that the economic benefit of closing the educational achievement gaps between children of different classes would be $70 billion each year. Do Social Security Payroll Taxes Need to Increase?